IBASSIN: 2017 Bassmaster Elites St. Lawrence River Day 2: KVD continues to lead with 43-13lbs! 2017 Bassmaster Elites St. Lawrence River Day 2: KVD continues to lead with 43-13lbs! One the biggest names in professional bass fishing history managed to hold his ground at the top of the leaderboard during Friday's Huk Bassmaster Elite at St. Lawrence River presented by Go RVing. Kevin VanDam — a four-time winner of the GEICO Bassmaster Classic and seven-time Toyota Bassmaster Angler of the Year — caught five bass that weighed 19 pounds, 8 ounces and remained in the lead with a two-day total of 43-13. The 23-time B.A.S.S. winner from Kalamazoo, Mich., said Friday's weather conditions in upstate New York didn't help the technique he's using. "When the wind is blowing the same direction as the current, it really speeds it up — and this afternoon it was really blowing," he said. "That makes it a lot harder to get a good drift, to get that weight moving with your bait so it's really natural to the fish. "When it's calm and the current is slow, it's a lot easier to get them to bite." If that's the case, Saturday's weather forecast, which is calling for much lighter winds, favors VanDam — and he has little margin for error. 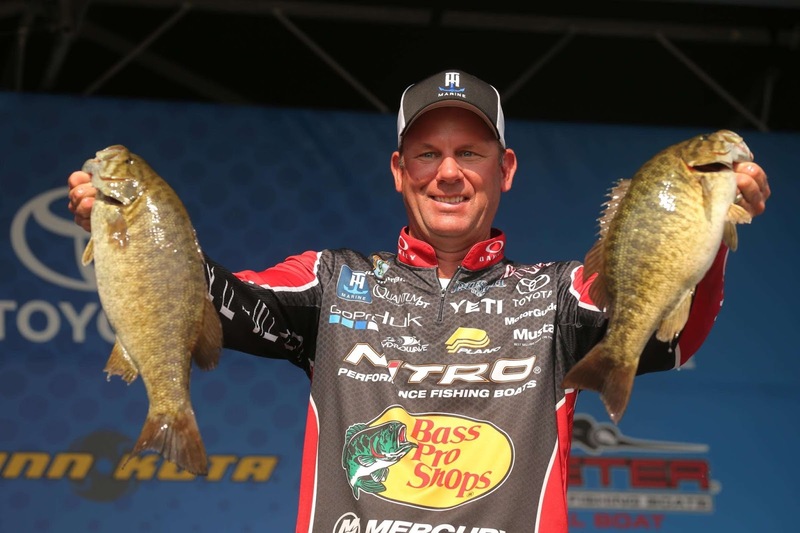 Another former Bassmaster Classic winner, Casey Ashley of Donalds, S.C., is right on his heels. Ashley caught 21-14 Friday and jumped from sixth place into second with a two-day total of 42-12. Unlike VanDam, who started slow and finished strong Friday, Ashley caught good fish immediately. "I started off with a bang," said Ashley, who won the 2015 Classic on South Carolina's Lake Hartwell. "My first fish weighed about 4-12, and then I caught three big ones real quick." Then things cooled off, as Ashley said he was also affected by the wind. "After I caught those first four, things got really slow," he said. "But I could still see the fish in there. "The wind shifted and was blowing more west than south. In that place where I'm fishing, they just seem to like a south wind." As VanDam and Ashley are battling for the tournament victory and its $100,000 first-place prize, they also occupy two of the top three spots in the Toyota Bassmaster Angler of the Year race. Ashley is in the lead with 619 points, followed by Idaho pro Brandon Palaniuk (615) and VanDam (604). Another developing storyline for the event is the battle between KVD and his nephew, Jonathon VanDam. The younger VanDam caught 21-15 Friday and moved into third place with 42-8. "It's supercool when we're both in the running," KVD said. "We talk multiple times during practice just to see what the other is seeing and finding out. We fish, really, very differently. But the general things make a big difference when you're smallmouth fishing. "He's got a lot of pressure on him right now to qualify for the Classic, but he's also got a lot of confidence. That's one thing that all VanDams have is a lot of confidence." Jonathon, who has missed the Classic the past three years, said the fishing has been slow for him — despite what the standings say. "I think I'm around the right kind of fish, but it's just really hard to get them to bite," he said. "I'm just fishing shallow and only getting a handful of bites. "I'm around some really big ones. All of the ones that I've weighed in so far haven't even been close to what I've seen." Palaniuk made the biggest jump Friday with a 25-pound bag that pushed his two-day total to 40-15. He rose from 72nd place all the way to ninth. "It's all about the area here, getting around the right fish," Palaniuk said. "Today, I went to an area that I found in practice, and they were there. "I didn't go there yesterday because I thought I could catch 22 to 25 doing something else." The field will now be trimmed to the Top 51 anglers for Saturday's semifinal round. Takeoff will be at 6:15 a.m. ET from Whittaker Park, with the weigh-in scheduled back at the park for 3:15 p.m.
Only the Top 12 anglers will advance to Championship Sunday.